Since the beginning of the year, work has been full of long days. I usually start around 6am and get home around 5pm. By that point, I want nothing to do in the kitchen but dinner has to get on the table somehow. I've planned some prepared meals for the week, but even if I didn't, my kitchen is fully stocked with enough ingredients to have a week night "Iron Chef" challenge with myself. It was one of those nights and I ended up throwing whatever I had in the IP... and before I knew it, dinner was ready. 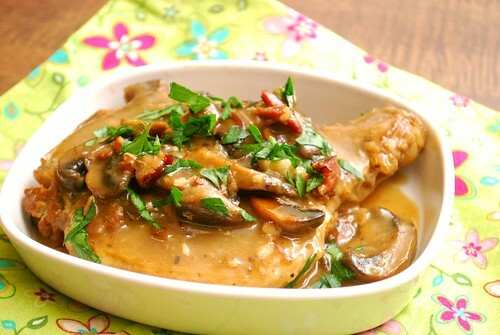 These Smothered Pork Chops with Mushroom Gravy came together in the same amount of time it took me to change into more comfortable clothes, help my son with homework and have a cup of tea! The dish itself was perfectly comforting with tender pork chops drenched in a rich mushroom gravy with a hint of bacon goodness. Putting together this dish is easy in 3 steps. Saute, Pressure and Stir. Saute is exactly that; sauteing bacon, onion, garlic and mushrooms until softened, Pressure is adding seasoned pork chops into your Instant Pot and allowing it to come to pressure so it can do it's magic. And lastly, Stir is finishing up the dish with cream of mushroom soup (I used fat free but any kind will do). The soup gives the dish a richness combined with beef broth and natural juices from the pork to create a gravy. Plug in the IP and hit SAUTE. Add the bacon (if using), mushrooms, extra virgin olive oil, onion and garlic. Cook until bacon starts to brown and the mushrooms and onions are translucent. Season your pork chops on both sides with salt, pepper and garlic powder. Once bacon starts to brown and onion is translucent, add the pork chops, broth and thyme. Press CANCEL to stop the saute setting. Press MANUAL and adjust the time to the number of minutes below on HIGH pressure. Once at pressure, the display will reflect the number of minutes you initially set and will begin to countdown to 0 minutes. When the IP beeps after pressure cooking for the number of minutes you initially set, allow your IP to naturally release pressure. While naturally releasing pressure (also known as NRP or NR), the display will reflect numbers counting up from 1. The numbers indicate how many minutes the IP has stopped cooking since it beeped (or how many minutes it has been naturally releasing pressure). No need to touch your IP while it naturally releases pressure completely. The pin at the top of your IP will drop when all pressure has been released and it's safe to open. Serve with your choice of sides and garnish with fresh parsley. What's the difference between an Instant Pot and a regular pressure cooker? I have an 8-quart pressure cooker. Am I missing something? It's a specific brand of modern electric pressure cooker. As far as I can tell, it's also the most popular brand. If you look up recipes on Pinterest, many will have directions specifically for the Instant Pot brand. Makes a lot easier to follow the recipes when the author can tell you the specific button to hit. If you buy one, just get the 8 quart model. You don't have to fill it all the way for it to work correctly. Hi Joni! Thanks for your message. I don't have a print button for this recipe (yet) but in the meantime you can print by clicking [CTRL] + [P] to print the page. I should have the recipe updated with a print feature by the end of the weekend. Print button hasn't been installed yet - should be in by this weekend - 9/15. In the meantime you can print by clicking [CTRL] + [P] to print the page. Hi, I'm JL in Portland, OR. In the instructions at #7 you have a list of 12 different cook times. Is this for different numbers of chops in the pot? 6. Press CANCEL to stop the saute setting. Press MANUAL and adjust the time to the number of minutes below on HIGH pressure. The mushrooms are not meant to stay firm and hold their shape/texture... the mushrooms are to add to the 'gravy' of the recipe and impart its flavor so it enhances the pork when served. If you prefer to have mushrooms retain their shape/texture, you can add them later in the process. I'm going to try this with chicken breast and dirty rice on the side. It looks amazing. This recipe was just ok. If I make it again, I think I'll give the pork a quick saute first and maybe add the juice of a lemon in with the soup at the end. I did make it from frozen which was a huge plus.